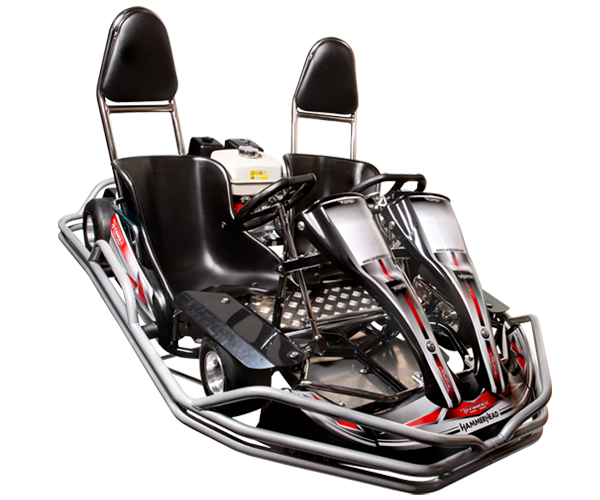 Caroli Twin Hammerhead is our twin kart. It’s driven from the left side using hand throttle and handbrake. Both steering wheels can be used for steering, but only the steering wheel on the left side can be used to accelerate or slow. The body work protects all wires, tubes, rotating and hot parts. Quick mounted plastic covers and split rear bearing make rear axle removal easy, in order to simplify maintenance. The CRMO steel safety frame is designed to protect the driver and the chassi in case of high impact collision. The safety frame is mounted on heavy duty silent blocks and offers the kart maximum crash protection. In case of high impact the safety frame can move to reduce the risk of personal injury. Extra protection pipes can be included as an optional extra. A spring loaded semi-collapsible support on the steering column greatly. Caroli Twin Hammerhead has Honda GX270RH as standard. It’s excellent for both education and for disabled drivers. Caroli Twin Hammerhead can be driven by drivers between 135cm and 200 cm tall.